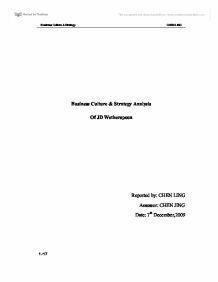 Business Culture & Strategy Analysis Of JD Wetherspoon Reported by: CHEN LING Assessor: CHEN JING Date: 7th December,2009 Content Page 1. Introduction.....................................................................3 2. Discussion........................................................................4 2.1 Section 1...........................................................................4 2.1.1 SPELT Analysis 2.1.2 SWOT Analysis 2.1.3 Guide lines 2.2 Section 2...........................................................................7 2.2.1 Shared Values& Taken for Granted Assumption 2.2.2 JD' Culture 2.2.3 Organisation Culture& Behaviour 2.2.4 Culture Comparison 2.3 Section 3...........................................................................9 2.3.1 Strategy theory 2.3.2 Strategy during 1980s and 1990s 2.3.3 Strategy in 21st century 2.3.4 Consider factors before changing strategy 2.3.5 "Business strategy" and "strategic choice" 2.3.6 Considered issues 2.4 Section 4...........................................................................14 2.4.1 Forces for changes 2.4.2 Business ethics leads to changes 2.4.3 Roles played in dealing with changes 2.4.4 Advices 3. Conclusion ......................................................................17 4. Recommendation ..............................................................17 5. Reference ........................................................................17 1. Introduction JD Wetherspoon founded by Tim Martin in 1979 offered cheap beer, good conversation and solid architecture. It became a plc in 1992 consisted of a chain of 44 pubs, and now it has over 600 pubs. In 2002, about 10 years after flotation, its share price rose to more than ten original values. In this report the JD Wetherspoon's changes in the business environment will be analyzed. Considering the relationship between the organizational culture and organizational behavior, some management approach will be provided on facing different cultures in the company. Meanwhile the company's business strategy will be investigated. Referred to the changes in strategy and causing factors, some advice in coping with these changes will be given at last. 2. Discussion 1. 2. 2.1 Section 1:External Environment 2.1.1 Give example of factors affecting the way it behaved. SPELT Analysis Social The people's living styles have changed. More persons prefer drinking at home with families. Most pubs now have a dedicated family dining area. Political The traditional link between the brewing companies and pubs known as the 'tie house' system had been broken by a ruling from the Monopolies and Mergers Commission which severely limited the number of pubs which a brewer could operate. ...read more. Martin may lose his power of management with the scattering of right. On changing the management, staffs must follow it under the power of Martin. It may be poor at implementing change management. Less time will be cost on decision-making. More time will be cost on discussion until meeting agreement. 2.3 Section 3 : Business Strategy 2.3.1 Explain four possible strategies which organizations may adopt. Michael Porter's Generic Strategies (quickmba,2009) Strategy Definition Appropriate environment Overall Low-Cost Provider Strategy It means low overall costs, not just low manufacturing or production costs! * Price competition is vigorous * Product is standardized or readily available from many suppliers * There are few ways to achieve differentiation that have value to buyers * Most buyers use product in the same way * Buyers incur low switching costs * Buyers are large and have significant bargaining power * Industry newcomers use introductory low prices to attract buyers and build customer base Broad Differentiation strategy Positioning a brand in such a way as to differentiate it from the competition and establish an image that is unique. * There are many ways to differentiate a product that have value and please customers * Buyer needs and used are diverse * Few rivals are following a similar differentiation approach * Technological change and product innovation are fast paced Best-cost Provider Strategies Make an upscale product at lower cost * Where buyer diversity makes product differentiation * Where many buyers are also sensitive to price and value Focus/Niche Strategy Involve concentrated attention on a narrow piece of the total market * Choose a market where buyers have distinctive preferences, special requirements or unique needs 2.3.2 Which strategy JD would follow during 1980s and 1990s. From 1980s to 1990s, the main strategy JD followed was broad differentiation Strategy. Tim Martin's model for a pub has meant that JD pubs were based on a number of distinguishing characteristics: * They sell a wide range of real ale beers at low prices * They do not ...read more. Leader With increase concern on the worker's right, he fosters a proper work atmosphere for the staffs and motivates his people to do involvement and communication in the company. Monitor As executive chairman, he travelled round the country visiting pubs and carried all his business documents. After he gave up day-to-day control to the company, he still contribute to the way the business operate as he still holds 15% of the shares. Disseminator 95% of company staff were happy with his 'No' campaign. Entrepreneur He has a policy of expansion which helps the company's chains increase from 44 pubs to more than 600 pubs. With the decrease of profitability, he made some changes with altering the outlets. Resource allocator As the top leader in the company, he also controls and authorizes the use of organisational resources, especially when making strategies according to the changes. 2.4.4 Advices Advices on analyzing a change situation * Being aware of required change is a very important element of the management of any organization. * The internal and external environments can be summarized using SPELT analysis. * The relative power and interest of the stakeholders of the organization should be identified. * Identify the goals of the organization. Advices on overcoming any resistance to change * Changing an organizational structure Moving from centralized to decentralized structure/ improvement in the quality of working life * Changing management style Involving employees more directly/moving organizational decision-making downwards * Changing the people and the way they look at their tasks. Team building/task design 3. Conclusion In this report, the company's internal and external environment and the industry environment have been analyzed. The organizational culture and the related behavior were discussed. Some business strategies were analysed. With the changes the company has faced, some advice was given in order to manage the changes. 4. Recommendation * The total cost of the project should be concentrated. * Changes is always happening, the analysis should be made on time. * Market research should be made before decistion-making. * Feedback should be collected from the staff and customers. 5. ...read more. The writer makes some good points and shows good understanding of the situation at Weatherspoons. There is too much repetition and at times I am less sure that the writer understands what they are saying. Also, 50% of the production is done on client demand, which allows the chain to constantly provide its costumer with updated products. The supply chain permits the rotation of the products that aren't sold in other countries in order to reach one of the main principles adopted by the company: 0 Inventories. Tesco were able to therefore target efforts to better and improve the accessibility of products to the disabled community. As a result of this Tesco Monaghan have now widened aisles for wheelchair use and made aisles shorter. annual report This internal source of written information of the Statement of Directors? responsibilities in 2012 in annual report explain what the directors were responsible in 2012 for example they were ?responsible for keeping accounting records which disclose with reasonable accuracy? this shows the internal information provides information to what their target was and how they have achieved it. E-mails: Tesco can take details of their regular customers such as their e-mail addresses. If they have any new offers they can inform their customers through e-mail. They can keep in touch with their customers through e-mail and ask them for feedback and if they have any problem with their services. contact the person whoever they want to contact efficiently knowing that the person they are trying to reach will receive the message. They can also use is as a way to keep in contact with their customers and update them about things like special offers and promotions to avoid losing them.